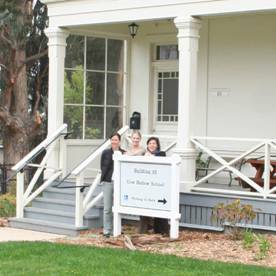 Wendy Murphy (parent), Darcy Campbell (Director), and Julie Parker Benello (parent) (left to right) outside Cow Hollow School in the Presidio. One day in the Spring of 2006, Cow Hollow School parent Wendy Murphy asked fellow parent Julie Parker Benello “Aren’t those new tablecloths in the classroom made of PVC vinyl, that toxic stuff?” Julie, being one of the producers of the documentary film Blue Vinyl exposing the dangers of PVC, said “Yes indeed. I noticed that too.” On a play date with their daughters at the Randall Museum, Julie and Wendy talked again. While drinking water out of their identical stainless steel Klean Kanteens (an alternative to plastic water bottles), the idea was launched to “green” their daughters’ preschool. Since the school would be moving from the Cow Hollow neighborhood in San Francisco to a historic building in the Presidio in September 2006, Wendy and Julie saw a unique opportunity to green the renovation process of the new school site. They mentioned this to Cow Hollow Director, Darcy Campbell, and school board president, Amy Grady, and they both immediately embraced the idea, recognizing that this fit with the school’s philosophy of educating the whole child and providing a healthy environment in which to teach. Julie invited Deborah Moore of the Green Schools Initiative to tour the new school site with the Presidio Land Trust (who was responsible for the renovations) to make sure a green agenda was inserted into the process. Darcy later invited Deborah back to speak on a panel as part of a parent education night devoted to the issue of a Healthy School Initiative, which resulted in greater parent “buy-in” to the idea. Wendy Murphy put together a Healthy School Initiative, and Green Buying Guidelines and Program Recommendations. Following these Green Buying guidelines, Cow Hollow has procured: paint with low chemical emissions; sustainable, low-formaldehyde, solid-wood furniture; non-chemical pesticides and herbicides used indoors and outdoors; a worm compost for food waste; recycled paper products; non-toxic, biodegradable and chlorine-free cleaning products; a solvent-free carpet cleaning service; new toys made of natural materials; Advanced Water Filters sink-top three-stage water filter; and healthy snack requirements. They also adopted a Healthy School Initiative mission statement that defines the school’s commitment “to improving the health of our children, staff, parents and the environment” and considerations: long-term and short-term costs, health impacts on children, staff and parents, environmental impacts, and consistency with school philosophy and values. Surprisingly, they have not had to increase their budget to accommodate this new program, primarily because parents have offered to donate items (HEPA vacuum), have donated funds toward specific items (PVC-free tablecloths from Mimi the Sardine) and donated specialized services (interior design and drinking water analysis). Local businesses have helped: Paul d’Orleans Painting donated an interior painting consultation and Spring, a Polk Street retailer, provided discounts on green cleaners. While many of the items purchased are expensive (school furniture and toys), they are also very high quality, thus reducing long-term costs. The focus on waste reduction is decreasing costs for the school (simple cleaning supplies, printing on scratch paper, reuseable dishware for snacks/lunches, web/email-based communication to parents instead of paper-based). Costs of green renovation materials were comparable to conventional materials. They also try to buy from inexpensive, but environmentally-responsible companies (like IKEA, which is phasing out toxins like PVC and brominated flame retardants). And energy efficiency at the new site is helping reduce operating costs (very high efficiency boiler system, energy efficient lighting). The teachers incorporate environmental awareness, compassion for animals, and nature walks every day. The children in the four-year-old program, for example, compost with great excitement. They have become actively engaged in collecting food scraps and soiled napkins and composting them in the worm bin, both reducing the amount of garbage and instilling in them a sense of stewardship and responsibility for keeping our planet healthy and safe. Recycling efforts are also underway. For Cow Hollow School, this initiative has been a wonderful example of how to have a meaningful impact on the school at the grassroots level with a ripple effect throughout the larger community. Embodying the old adage “You don’t know unless you ask,” they have been able to generate donations and discounts to help implement their efforts and overcome the possible obstacle of “it’s too expensive.” There are still many things they want to consider such as waste-free lunches, encouraging other transit (carpooling, walking, buses, cycling), as well as renewable energy certificates to offset their energy use and future parent education to raise awareness of how to encourage a healthier and more sustainable lifestyle at home. For more information about Cow Hollow School, visit www.cowhollowpreschool.org and the Healthy School Initiative page.